What specs do you think a 20th Anniversary Celeron(s) will have? So I am thinking Intel probably has plans for 20th Anniversary Celeron. EDIT: 20th Anniversary Celeron as a mobile version would be interesting as well. Optane support might be a good way to get a little interest in Optane. Unlocked 2C4T Celeron with Optane support and even GT2 would be interesting. First of all, what are the Skylake and Kaby Lake Celerons in terms of iGPU? Is Intel making anything lower than GT2 these days? Second, I don't see the cache increasing, even for an Anniv. Ed. CPU. The Haswell Anniv. Ed. Pentium didn't have any extra cache, and in fact, because it was a "32xx" rather than a "34xx", the memory bus was crippled to DDR3-1333 max, rather than DDR3-1600. Coffee Lake/Kaby Lake/Skylake desktop Celeron has GT1, Pentium has GT1 or GT2. It's the 20th year of the Celeron. That was all that was necessary to release the G3258 unlocked Pentium. That was also back in 2014 when dual cores were still usable for modern gaming. Now that it is 2018, things have greatly changed. What about a rather low-clocked / no-turbo 4C/4T CPU? That would blow some minds. Maybe blow Intel's product stack up too. I'm thinking something like AMD Sempron 3850 AM1 CPU, a 1.3Ghz quad-core. Only, 2.0Ghz for the Anniv. Celeron. Personally if I was Intel I would just drop the Celeron line completely and release a 25th Anniversary unlocked Coffee Lake Pentium running at 4Ghz. 1 core, 1 thread. 266 Mhz, no turbo and no cache. I wonder how high they could clock a single core Coffee Lake celeron? Octo core Atom Celeron :V? P.S. At one time Celerons and Pentiums had the same core and thread count (the only difference between the two was clockspeed and a difference of 1MB cache), so I see that returning eventually. It may not increase, but I think there is room for bumping up to 3MB. I wrote down 4MB mostly because I was thinking of the Celeron 300A (released 1998) which was a very special case of a celeron having increased (from zero) cache that also happened to be on the processor rather than a separate cartridge making it high performance yet affordable. It may not increase, but I think there is room certainly for bumping up to 3MB. I wrote down 4MB mostly because I was thinking of the Celeron 300A (released 1998) which was a very special case of a celeron having increased (from zero) cache that also happened to be on the processor rather than a separate cartridge making it high performance yet affordable. I remember those. In fact I was going build a Socket 370 dual Celeron system using the Abit BP6(?) board running BeOS just because I could back in '99. That would be a particularly great idea IMO if we found out Intel ended up designing an Optane interface that directly connects to the CPU (rather than go through the PCIe bus) on the higher end consumer dies first. I really don't see why celebrating the most neutered CPU in the world is exciting. 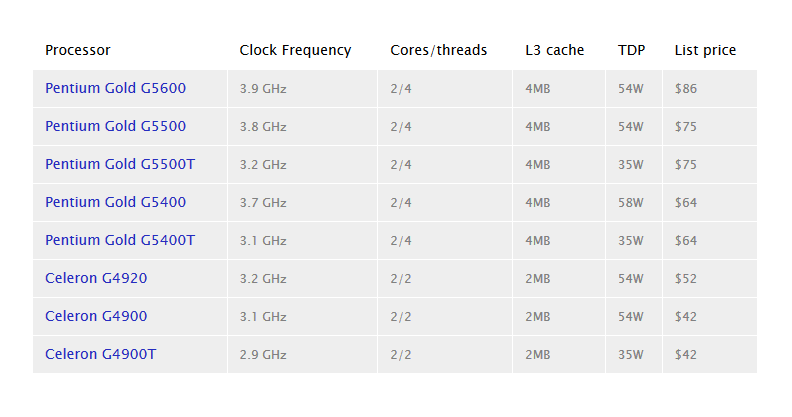 At this point I even see 2c/4t CPUs as only suitable for low cost ChromeOS like devices. The baseline for basic mainstream PCs should be true quad-core processors.such as the i3-8100 and Ryzen 2200G. I'm with you on this....Unless it's the fabled 10 GHz chip we should have seen years ago. Can you imagine the TDP and heat output of those? I would think 2C/4T is still fine for most general home computer use. Rendering or gaming can certainly use more cores, but the people doing that ought to know what they need. Stock 3GHz, overclockable to 4.5GHz+, in homage to the original Celeron 300A which was overclockable to 450MHz+. Was my first foray into overclocking... ahhh the memories! Back then a 450MHz Celeron could rival the fastest CPU on the market, the PII 450. Sadly, even an overclockable modern Celeron (assuming it stays dual core) wouldn't come close to any top end CPU. I like the idea of a anniversary edition dual core non-HT CFL @ 4.5GHz. Could be useful for certain things. And not much else. If they were true to form, it wouldn't even have an L3 cache. The first (Covington) Celeron didn't have an L2 cache, that was only added with the (Mendocino) 300A. Which was the first retail CPU to feature on-die L2 cache. So they should really release an unlocked low-clocked 6C/12T CFL version with an L4 cache to pay homage to the 300A. Though Broadwell would have it beat there. Again, unlikely. Unfortunately. Old Celerons could be overclocked to match Intel's fastest CPU. In honor of that, I propose an unlocked 2GHz 18 core Celeron.